The Linux Guru blog tries to help people to explore the world of linux! Cherokee web server - the next generation? Today I was surfing on the net while I was running some loong SELECT statemens on MySQL server. On the linuxquestions forum I found a thread about new web server called Cherokee. People said Cherokee's supposed to be quite fast (double as fast as Apache!) so I had to try it out myself! I compiled Cherokee with basic settings and used default configuration files to run the tests - all I wanted to do was to test how fast Cherokee really is. On the first test I used Cherokees default index page (sized 1700 ~bytes). I used Apache Benchmark to test the capacity of the web servers: 20 concurrent connections and 100k requests. As you can see, Cherokee is almost double as fast serving single small file. The developers at http://www.cherokee-project.com say that they have developed some über-cool I/O gadget that makes this possible. As you can see, this time the difference is allmost next to nothing. So, which of the web servers is really faster? Can't say. The Apache was default installation that comes with Fedora Core. Cherokee was compiled. We were testing only one static file. In few days I'm going to make a test including Apache, Lighty, Nginx and Cherokee, testing static files (multifiles! ), php scripts and all other kewl stuff. Then we'll see which of 'em is really faster! It's very easy and very fast to compile Lighty to your Linux box on default settings. 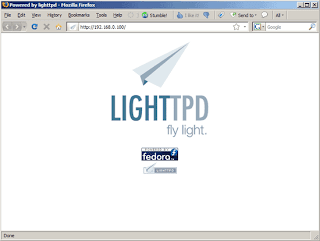 Here's and example how to compile Lighttpd 1.4.20 on CentOS 5.1. 1) Download latest version of lighty from http://www.lighttpd.net/download. 2) Extract the contents to your template directory. 6) If you use another prefix instead of default, you have to copy lighttpd.conf manually. After that you have to make default directories (htdocs & log directory) manually. 8) Connect localhost:80 with our web browser! Have you ever seen this very annoying error message? I bet you have! I had to move little over 36k files in one directory to another box. Scp and both let me know there's too many files for them to handle. So what to do? Each shell session has a pre-configured amount of storage with a hard limit. To check it you can type getconf ARG_MAX which will type whatever the max arg is in your box. Sit back and enjoy the ride while box archives your files! Nginx (pronounced Engine-X) is a russian open source httpd server originally written by Igor Sysoev back in 2005. Nginx is a very light weight httpd server and reverse proxy. It is estimated that approx. 3 per cent of all web servers run nginx. In Russia the number is as high as 20 percent, including some of their biggest web sites. Nginx is also used by Wordpress.com and 4chan. Why use Nginx instead of Apache or Lighty? Nginx should be fast. I mean FAST. Fast in a way of over 10000 concurrent requests / sec per server. Now that's fast! I have wanted to screw 'round with Nginx for a while, so here goes nothing! Nginx can be downloaded from www.nginx.net. Simple web page displays the latest distribution packages and small introduction. Further instructions can be found from Nginx Wiki. After this Nginx is ready to serve static files! Sbin directory has only nginx executable file which starts up httpd. Html directory is same as htdocs directory in Apache - copy your files here in order to serve 'em to the world! Conf-file has all configuration files. These are default configuration parameters to set user and logging preferences. If you are your box to run many different applications it is a good idea to change default user to something else, like "nginx" or "www_user". Worker_connections parameter sets the maximum number of connections each worker can handle. This is quite good default value. You should not tamper round with mime types because you will likely end up with screwed up web server! If you want to, you can also change default log format in the following part. TCP nopush setting means that HTTP response hearders are all sent in one packet. Sendfile setting means that Nginx ignores the details of the file it is sending and uses kernel sendfile support instead. Keepalive setting defines how long server waits for users packets. This should be changed only to few seconds on busy sites. Gzip compression saves bandwith on site, depending what kind of packets server is sending. The following server part is just like server settings on Apache HTTPD and if you have tampered 'round with Apache before this is quite straightforward to you. These were basic examples of Nginx and what one can do with it. I stripped some configuration examples but here you can see the basics. Later we're going to configure Nginx to use PHP and we're going thru how to use mod_rewrite with Nginx. Have you ever wondered which is faster, Apache 2 or Lighttpd? Everyone says that Lighttpd (or lighty) is a much faster, but is it really so? The benchmark shows how Apache 2.2.3 compares to Lighttpd 1.4.13 when delivering static HTML file approx 50 kilobytes. Test was made with Apache benchmark. The test was made on a Debian Etch running inside VMware. The box was quite old but it shouldn't affect on the tendency. *Apache 2.2.3 mpm-prefork with default Debian configuration. *Lighttpd 1.4.13 with default Debian configuration. The HTML file was approx 50 kilobytes in size and it was saved as test.html. As you can see, lighty is almost one third faster on static pages! Knowin this one has to consider if it is worth using lighty instead of Apache. Personally I choose Apache? Why? More modules and knowledge. Maybe some day I'll start using Lighty. Or Nginx. Woudln't that be kewl? Here's a short list of basic commands in UNIX. I have copied the list originally from another page which I cannot remember and I did some editing to it. * more filename --- shows the first part of a file. Hit the space bar to see more or q to quit. You can use /pattern to search for a pattern. * emacs filename --- is an editor that lets you create and edit a file. * rm filename --- removes a file. * gzip filename --- compresses files, so that they take up much less space. * gunzip filename --- uncompresses files compressed by gzip. * cd dirname --- change directory. * pwd --- tells you where you currently are. * grep string filename(s) --- looks for the string in the files. This can be useful a lot of purposes, e.g. finding the right file among many. * whoami --- returns your username. * passwd --- lets you change your password. * ps -u yourusername --- lists your processes. There are many ways to restart your linux computer. If you are using GUI interface, shutting down or rebooting the computer depends of the GUI you are using. Usually shutdown, reboot etc. commands are located thru the GUI's main menu or bar located at the bottom of the screen. *simpy type reboot and hit enter, and the computer restarts. Many Linux distributions use RPM as the default application management system. This means that when using RPM packages, it is quite easy to install applications to your favorite Linux distributions. RPM is originally developed by Red Hat, but nowadays you can run into rpm in many other linux distributions (for example Fedora Core, CentOS, Mandriva or Yellow Dog Linux) and even on other operating systems (Novel Netware and IBM Aix). Also source codes can be downloaded in rpm packages. For example httpd-2.23-2.i386.src.rpm. RPM files with the noarch.rpm extension refer to files that don't depend on a computer's architecture. * rpm -qi package - displays (already installed ) information about application "package"
With these simple commands you can install rpm packages to your linux distribution! I have written shortly about fail2ban earlier, but since fail2ban is so awesome application, I wanted to tell a little more about the application. It works like DenyHosts, which I am planning to test later. Fail2ban is basically a tool that observers all login attempts to your server thru various services, like SSH, HTTPD, FTP, Telnet (oh god, no telnet, please!). If it finds failed login attempt many times in a row from the same IP / host, it blocks that IP / host with an iptables firewall rule. Handy piece of software, I say! We're going to configure fail2ban to monitor SSH server, because I'm not using any other open service in my linux server. If you're using proftpd or some else server that requires authentication, it is quite easy to implement the changes to those servers, too! Easiest way to install fail2ban is to use yum. As I have said before, it is easy to use yum and you win a lots of time when using it. If you know exactly what you're doing, go ahead and compile your own applications! Fail2ban configuration files can be found in the /etc/fail2ban directory. The default configuration is in jail.conf file. Take a look and you see it is not hard to understand! You can see [default] section at the beginning of the configuration file. You can override the settings below. * ignoreip: This is a space-separated list of IP addresses that cannot be blocked by fail2ban. For example, if the computer from which you're connecting to the server has a static IP address, you might want to list it here. * bantime: Time in seconds that a host is blocked if it was caught by fail2ban (600 seconds = 10 minutes). * maxretry: Max. number of failed login attempts before a host is blocked by fail2ban. * filter: Refers to the appropriate filter file in /etc/fail2ban/filter.d. * action: Refers to the appropriate action file in /etc/fail2ban/action.d. * logpath: The log file that fail2ban checks for failed login attempts. Make sure to replace the email address you@mail.com with your own email address so that you get notified when someone gets blocked by fail2ban. After you have edited your configuration to the way you want it, restart your fail2ban and you're good to go! Lighttpd, or light, is a fast, light and secure webserver which is designed and optimized for speed-critical environments. Many huge websites (Youtube, Wikipedia for example) use lighttpd to serve static content. Also many sites that get more than thousand hits / second use lighty. Compared to Apache HTTPD or nginx, Lighttpd is not as fust as nginx but it is easier to configure and implement. Compared to Apache, it is faster but has less options. You have to consider which httpd server to use. I personally love to use Apache because of its modules, but I wouldn't hesitate to change to lighty! First thing you need to do - if you don't allready have MySQL installed - is to install MySQL. I personally install mysql server from binaries but this is the easiest and fastest way to get your mysql server up and running. When you install your mysql server, there is no password set for mysql root user. Unless you're using some virtual linux running on your personal laptop used only for developing things, change this immediatelly! That's it! Restart your lighty and you're all good to go! Today I ran up to quite intresting product from Russia - Nginx. Nginx is high performance web and proxy server and, what I have heard, it's capable to run quite high load on very low requirements. Regarding to this article, Wordpress.com is using Nginx as load balancer, handling over 8000 requests / sec. That's quite impressive! What's best, Nginx is really lightweight. According to testimonials in Nginx wiki, this web server can be run with really low RAM. Excellent. I'm going to screw 'round with this piece of software now. Going to report you back later! And what does the request do? It seems like the request above is called "Internal Dummy Connection", and it's a way for apache to let it's children processes know it's time to die. It's usually nothing you should worry about, but if you see many child processes spawn and die, you may want to configure MinSpareServers and MaxSpareServers directives, and your MaxRequestsPerChild. A while ago I had a problem. I had to change my file servers hard drives, and I didn't have large enough hard drive to take copies of. This lead to the situation where I had copies of my data spread on various computers, and after I got my server up and running again, I realized there were quite many duplicate files on my server. Luckily I found a nice small application called fdupes. This program goes thru directories and creates MD5 sum of every file. After the process it compares the MD5 sums and lets the user know which files are duplicates. That's it! I've had enough with TC on my box. And all it took was six days. Before it, I ran TC on Ubuntu for one week. And now it's history! My problems began when I was installing TC on Ubuntu. Or actually, there was no problem when installing Truecrypt. I found this version of Truecrypt, build on X86_64. The problems began when I was trying to use ext2 or ext3 -filesystem on Ubuntu. Truecrypt supports FAT32 and NTFS -filesystems straight out of the box. Can you imagine Linux box using FAT filesystem? Well, luckily there is a way how to use some other filesystem on Truecrypt. Well, did it work? No, sir! mkfs.ext3 crashed my machine. So did mkfs.ext2. What's the solution? Reiserfs! After few hours of struggle, I finally had my (k)Ubuntu installation with a hard drive encrypted with Truecrypt. The filesystem had to be Reiserfs, because mkfs with ext2/ext3 failed. After few days of usage, I ran into problem that my box started to crash randomly. I thought that the problem was xscreensaver, so I disabled it. I also had problems with (k)Ubuntu's firewall >> I decided to install my beloved Fedora Core. I managed to install Truecrypt using .deb files, and I allready had my hard drives encrypted with reiserfs. Goodbye, problems? So I thought. I started to move backups from my other boxes to ecrypted filesystems, and I ran into problems of crashing box. Again. Luckily this time I had my ssh session open with top runnig on the screen. I saw that my box's iowait was 99% and system load near 50 before crashing. Conclusion: Truecrypt doesn't like small files (like your picture collection, large amount of midi files, or even mp3 files. I tried to copy one 12gb tar archive from encrypted filesystem to "clean" filesystem, iowait 99% and crash. Again. At this point I decided that this is no time for me to use ecryption. Adios, Truecrypt! Maybe next time! I have to say, that the usage of TC was quite easy. Point n' click. But the results were bogus. What a shame. I must admit that I will follow truecrypt forums and if I find out that the performance problems are gone, I'll give it another shot. Here's few tips how to improve your SSHD security on your Fedora Core box. With these easy steps you can make sure no-one's gonna hack into your box. Fail2ban is a script, that actively tracks the connections against sshd. If someone tries to scan your sshd using many different account names and passwords, fail2ban denies connections from that IP for 15 minutes. The log file is found at /var/log. Fail2ban can also send email with information about banned IP-addresses. You can allow ssh connections only for specified accounts. After this, restart your sshd. By default, SSHD is located at port 22. Many port scanners try to locate ssh servers running at that address. If you change your sshd to a high port (above 1024), you get rid of many port scanning attempts. For example, nmap cannot scan ports above 1024. Hosts.deny controls which traffic you want to deny, and /etc/hosts.allow which traffic you want to allow. Now, after you restart your sshd, all sshd traffic is blocked. I wanted to use Joomla + JCE editor + madeyourweb -template on a web site. On left side there's a text saying "Template CSS classes", change this setting to No, and Voilá, align is left again. 3) Copy your template_css.css to another file, edit this file and force JCE Mambot to use this CSS file in "Custom CSS Classes" -option. This is a very short guide how to install x11vnc to your Fedora Core. x11vnc is by far the easiest available vnc server for Linux. Just download, configure/make, and off you go! And it works like a charm over ssh tunnel! 2) Make sure you have X Software Development packets installed on your FC. To be sure, just open your sytem >> add/remove software, scroll down to development, and make sure you have X on your "x11 development". 4) Now you have your x11vnc server ready to be tested... It's propably installed at /usr/bin/x11vnc, and you can test drive it by just typing the command "x11vnc". This is a *VERY* short guide how to install Truecrypt 5.0 on Fedora Core x86_64. I installed TC on FC8, but this guide *should* work on any FC platform. 3) Extract data.tar.gz to the root of your system. If you are using i386 -version of Fedora Core, you can download Ubuntu packet from TC's homepage and use it to install Truecrypt on your FC.